A bench grinder is a benchtop grinding machine which uses an abrasive wheel as the cutting tool. Whether you are into DIY home improvement or other craftwork projects, the best bench grinder is a great tool for your work needs. You can use a bench grinder to sharpen cutting tools like chisels, drill bits and lawnmower blades, or metal material used in your projects. Depending on the grinding wheel, the best bench grinder can also be used to polish, shape or buff metal before welding or fitting. A bench grinder typically comes with two rotating wheels which are each located on either side of the motor. Each wheel is partially covered by a guard, with the rest of the wheel exposed at the front of the grinder. There is a tool rest below and an eye shield mounted above the opening of the guard. To use a bench grinder, make sure that you perform a thorough safety check before turning the grinder on and have yourself decked in protective gear (safety glasses, steel-toed shoes or at the very least fully covered shoes, ear muffs and a face mask). When you turn the grinder on, turn to one side until the bench grinder reaches maximum speed. Then place the item you wish to grind in an angled position against the front wheel, about 25 to 30 degrees. Depending on what you intend to achieve, you can move the item back and forth against the grinding wheel if you are grinding parts of the item off or turn the item until it breaks off if you intend to cut through it. The wheel grit and constant back-and-forth motion will prevent the item from overheating. A bench grinder made from high quality parts will usually last longer than a bench grinder that is made of cheaper material. That said, maintenance is also important if you want to have a long-lasting bench grinder. Avoid bench grinders that have bad reviews when it comes to their safety features. You don’t want a bench grinder that could be a potential safety hazard. Depending on your tasks, you should also consider the motor specifications and determine if it is powerful enough for the tasks that you need to perform. Generally, a larger motor generates more power and will be more appropriate if you intend to use the bench grinder to cut tougher metal objects. For light-duty DIY projects, a medium motor should suffice. Using different wheels, you can buff, shape, sharpen, smoothen or polish various metal tools or objects. Abrasive grains and grit sizes are two key characteristics you should consider when it comes to the choice of grinding wheels. Aluminum oxide is a commonly used abrasive in grinding wheels and such wheels are usually used to cut and shape wrought iron and steel. Ceramic aluminum oxide is the latest development in the market that is mainly used for precision grinding when it comes to steels and alloys that are extremely tough to grind. Grit size refers to the size of individual abrasive grains in the wheels. Wheels with higher grit size can perform more delicate grinding jobs for materials that are harder and more brittle, or when finer finishes are required. 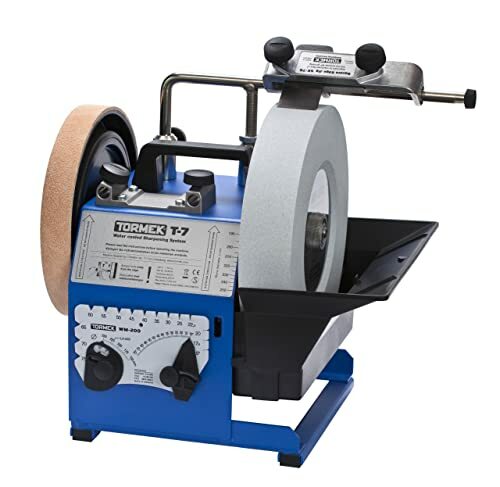 Bench grinders that offer wet grinding tend to produce a cleaner and more polished finish when it comes to sharpening your metal tools and objects because there is less friction involved. With wet grinding, your bench grinder and your tools are less likely to wear off. Some bench grinders include a cooling system so that you don’t have to worry about overheating due to regular sharpening and polishing of your metal tools and objects. Additional features can come in handy especially if you use the bench grinder frequently. Water trays are a good addition for you to cool down the metal object or item that you are grinding. Eye shields are important safety features that can protect you from flying particles or pieces during grinding. Well-functioning tool rests allow you to rest the tool or item that you are grinding to check that you are positioning it correctly. Built-in lights can be very useful if your work space isn’t as well-lit as you would like it to be. Now that you have a better idea of bench grinders, it’s time to check out some of the best bench grinders. Don’t be daunted by the myriad of choices out there! For the best bench grinders 2017, you can take a look at my top 5 picks below. For a small 16lb bench grinder below $50, the WEN 4276 almost sounds too good to be true. 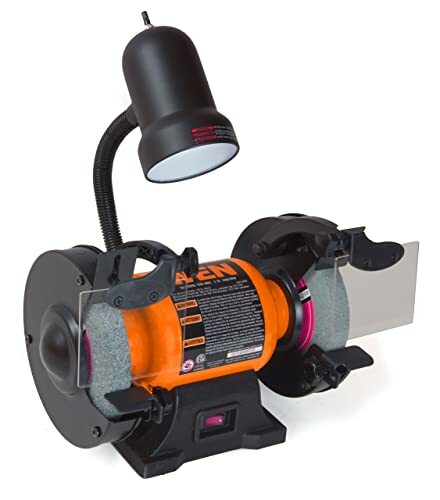 Many customer reviews have rated the WEN 4276 as the best bench grinder when it comes to light-duty work for sharpening, deburring and cleaning rusty metal tools and objects. The bench grinder comes with a 2.1-amp quick start-up motor that provides smooth and reliable performance up to speeds of 3,450 RPM. The WEN 4276 also comes with 36 and 60 grit wheels for you to work on a variety of tools and objects. It even has a built-in lamp to illuminate the workspace. The WEN 4276 comes with a two-year limited warranty. There are some customer complaints about missing hardware and defects that surface over time. Nevertheless, all things considered, the WEN 4276 is a great bang for your buck when it comes to a light-duty and economical bench grinder 2017 option. 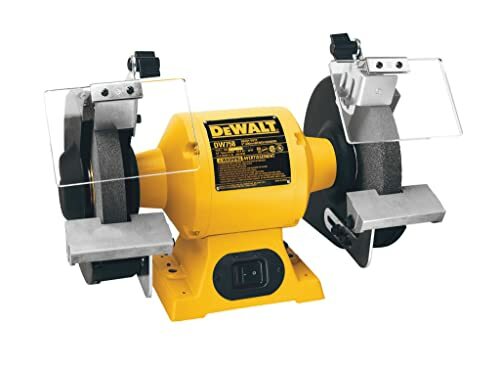 For a more durable bench grinder that is still pretty affordable, the DEWALT DW756 should be your top choice. This bench grinder features a rugged iron cast base for greater durability and precision-machined aluminium tool rests for greater accuracy when positioning your work. With a distance of 12.5 inches between its wheels, the DEWALT DW756 is wide enough for larger and longer grinding applications. Its 5/8 horsepower and 4-amp induction motor runs at 3,450 RPM and is capable of handling heavier-duty tasks compared to the WEN 4276. Like the WEN 4276, the DEWALT DW756 comes with 36 and 60 grit wheels to cater to your different DIY project and craftsman needs. In terms of product warranty, the DEWALT DW756 trumps the WEN 4276 with a three-year limited warranty which includes a one-year free service coverage. The Sunex 5002A is another budget-friendly bench grinder 2017 option. Similar to the DEWALT DW756, the Sunex 5002A is a great choice if you want a bench grinder that can handle heavier-duty tasks. With a 3/4 horsepower and 5-amp motor, this bench grinder can pack a punch when it comes to grinding hard metals. Other noteworthy features include its protective spark guard, adjustable eye shields and an adjustable goose-neck work lamp for better visibility. That said, some common customer complaints about the Sunex 5002A include its cheap and flimsy tool rests and poor snap ring design. It also comes with a shorter one-year warranty as compared to the DEWALT W756. In view of these, I would rate the Sunex 5002A as a runner-up if you are looking for a bench grinder within the $50-$100 price range. Like the DEWALT DW756, the DEWALT DW758 features an iron cast base, precision-machined aluminium tool rests, a 12.5-inch distance between its grinding wheels, as well as 36 grit and 60 grit wheels to accommodate different applications. This bench grinder’s 3/4 horsepower and 4.2-amp induction motor runs at 3,600 RPM (faster than the DW756), making it suitable for heavier-duty tasks. Similar to the DW756, some customers have commented that their DW758 seems to have grinding wheels that vibrate a lot during usage. Fortunately, that seems to be the exception rather than the norm based on the few reviews that pointed out this problem. Besides, most customers did not report much difficulty when it came to exchanging or returning a faulty product— the DEWALT DW758 comes with a three-year limited warranty, including a one-year free service coverage. So, if you want a bench grinder for professional daily use that is still reasonably affordable for an amateur or hobbyist, the DEWALT DW758 is your go-to option for the best bench grinder 2017. Wet grinding produces less friction than dry grinding, so you don’t have to be too concerned about overheating. Bench grinders that offer wet grinding usually have a longer useful life. The grinding result is also much cleaner and more polished than dry grinding. The downside, as is the case with the Tormek T-7, is that the grinder operates at a slower speed than the dry grinders I have featured above. The slow speed gives you maximum control and reduces the amount of flying metal particles. However, if you are looking for a bench grinder that provides superb sharpening and honing of your tools, then the Tormek T-7 is the best bench grinder 2017 option for you. This bench grinder comes with 11 different jigs that can suit tools and metal items of all shapes and types. The jig perfectly aligns the object or tool for precise grinding and sharpening. The angle adjustment tool also ensures that your object is positioned at the right angle during every use. The 10-inch grindstone comes with a stone grader that gives you the extra versatility to switch effortlessly from powerful grinding at 220 grits to fine polishing at 1,000 grits. The diamond truing and dressing tool can be used to maintain the condition of the grindstone. What’s more, the Tormek T-7’s water cooling technology is great for prolonging the useful lifespan of your tools. This sophisticated wet bench grinder comes with an expensive price tag, but many customers have nothing but rave reviews about its durability and effectiveness. For an industrial-grade bench grinder, the Tormek T-7 is jam packed with many cool features and it even comes with a seven-year warranty. For serious woodworkers and other professional handymen, the Tormek T-7 would be your best bench grinder 2017 investment if you need a bench grinder designed to undertake extended and heavy-duty usage. Whether you need to refashion metal items or objects or sharpen your working tools and keep them in tip-top condition, a bench grinder is a great tool that you may want to include in your work garage or home workshop. If you have a tight budget and don’t require a bench grinder for heavy-duty usage, the WEN 4276 is a reliable and decent option. At the other extreme, you have the Tormek T-7 for those who are looking for an industrial-grade bench grinder that is perfect for sharpening and honing a wide variety of hand tools. For good mid-range options, DEWALT and Sunex have the best bench grinders that are suitable for heavier-duty usage at affordable prices. Previous Post Quick and Easy Garage Organization Ideas You Must See Next Post Miter Saw vs Table Saw – Which Saw Makes the Cut?